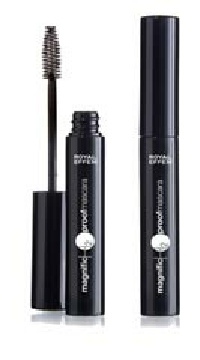 Magnific H2o proof Mascara combines an extra volume effect with the benefit of a waterproof formula. The result is exaggerated long-lasting lash thickness! Magnific H2o proof Mascara is the best mascara to confront hot weather, water at the pool and by the seaside or humidity at the gym, always keeping a perfect seductive gaze! It helps the lashes to keep the shape and at the same time it is light, soft and elastic. The formula has been studies to give the lashes a powerful volume. The formula contains a polymer with high resistance to water. A filmogen with a high plastic capacity and a film former that gets lashes in shape, fixed, leaving them light, soft and elastic. Thanks also to a very flowing spheric silica, the texture is easy to model and has an incredible volume effect.